KENNEDY SPACE CENTER, Fla — The support structure for NASA’s new super heavy-lift booster, the Space Launch System or SLS, had another element delivered to the agency’s Kennedy Space Center in Florida on April 10, 2015. The work platform delivered on Friday will allow engineers and technicians to work on a section of the launch vehicle that NASA hopes to use as part of a system to send crews to a boulder removed from an asteroid and transport to lunar orbit and, possibly, one day, the planet Mars. The work platform will provide access to NASA and Boeing engineers to service the 70 metric ton and later versions of the SLS which are currently scheduled to begin flight with Exploration Mission 1 (EM-1 ) – currently scheduled to take place in 2018. EM-1 will mark the second time that one of NASA’s new crew-rated spacecraft has taken to the skies. “Orion is the exploration spacecraft for NASA, and paired with the Space Launch System, or SLS, rocket it will allow us to explore the Solar System,” said Mark Geyer, program manager of Orion, which is based at Johnson Space Center in Houston. The first Orion capsule lifted off on Exploration Flight Test 1 on Dec. 5, 2014. 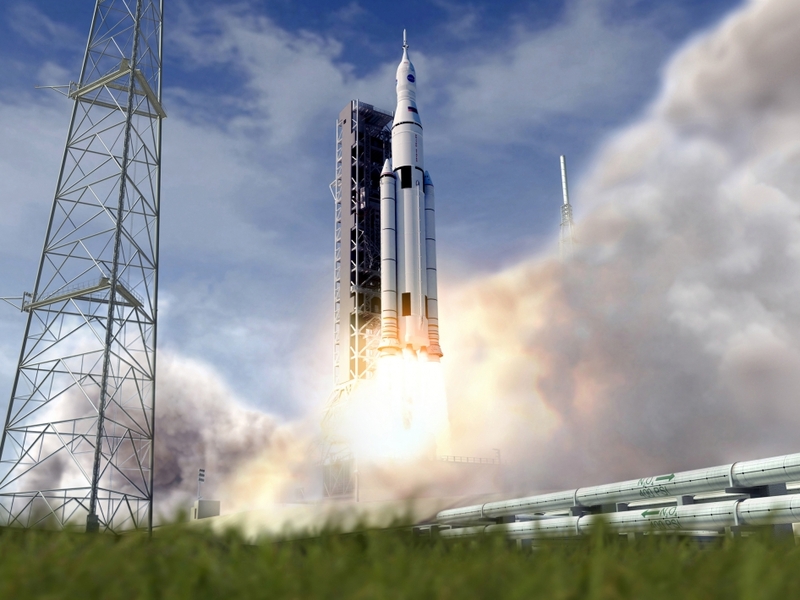 SLS was not ready for this mission, rather than wait, NASA opted to employ the most powerful U.S. booster available at that time – United Launch Alliance’s Delta IV Heavy. The work platform carried out the final leg of its journey to KSC via truck. The expansive nature of the segment caused it to take up a good portion of the road leading to the component’s final destination – the Vehicle Assembly Building (VAB ). The VAB is perhaps one of the most iconic structures that NASA has. Constructed in 1966, the VAB has been used to stack both the Saturn V Moon rocket as well as NASA’s now-retired fleet of orbiters during their 30 years of service. With NASA now tasked with returning to the business of sending astronauts beyond low-Earth orbit (LEO), the agency is working to modify the building for use on the SLS. Cool photos. Would be nice to know how wide and how long it is. The load was 38’6″. The length was 62′.